Hello all, we are Searay liveaboards, in the market for an RIB shore boat, dingy, or whatever else you call them. My question is how to store our dingy aboard. We do not have a davit above our hardtop, and the cost to install one is extremely prohibitive, much more than the dingy itself. My question is, how good are the swim-step dav its, and we are going to buy an inflatable dingy with a center console, are there swim-step da its that will work with them? Since most center console dinghies normally have a higher air draft and larger outboards on them they look, the roll-on system should work well if you have a wide enough swim platform. Our roll-on davit system would work with a center console, especially if we added yet another bracing strut. This is NOT the same as depending only on the swim platform and it's factory struts; I mean, adding more support from davit to transom (and we have some of that already). See Jatco Trillogy. Our installation is cantilevered so we can walk between RIB and transom, which puts even more strain on the system. Note there are trade-offs when operating with a stern-mounted dinghy this way. Try to find others with your exact same boat and talk to them if possible. There are quite a few options. A few key issues. Adequate support for the platform. Width of platform. And then what it does to your ride and performance of the boat. You're definitely impacting it by adding weight beyond the transom. On some boats, that is positive. On others, negative. Then how is it going to ride on the platform in rough conditions. It can be an issue if your rib is in the water with 2-3' of wave action. Weaver davits would not be the best choice given the weight of the RIB you have in mind, also the aft cabin vessel eliminates overhead pulley type system, the roll up ones discussed by previous posts probably the only real option. Well, it might be helpful if the OP would give us the specific information on the rib. Generally speaking from what he states, center console, they usually ain't light!
" buy an inflatable dingy with a center console"
Generally, but some do come under Weaver's maximum. Regardless, it would still be helpful to have weight and dimensions as the description covers a huge range of possibilities. Look on YachtWorld and see what others have. No need to re-invent the wheel. Another idea is Hurley davits. I'm trying to figure out the set up I want to go with on my 40 Mariner Europa style. I like the idea of being able to launch and retrieve the dink easily and the Hurley and also the roll on type 'look' good. For offshore passages, I'll need to get the dink up on top, I think??? Generally preferable. However, it is possible to find a stern davit/lift that raises the boat far enough to make keeping it there ok. Just make sure what you get matches your intended use plus a part of it will be how the added weight that far back impacts the ride and performance. I liked the roll on set up mentioned earlier. I called and it is no longer available. I guess the Hurley system is the only set up similar out there. 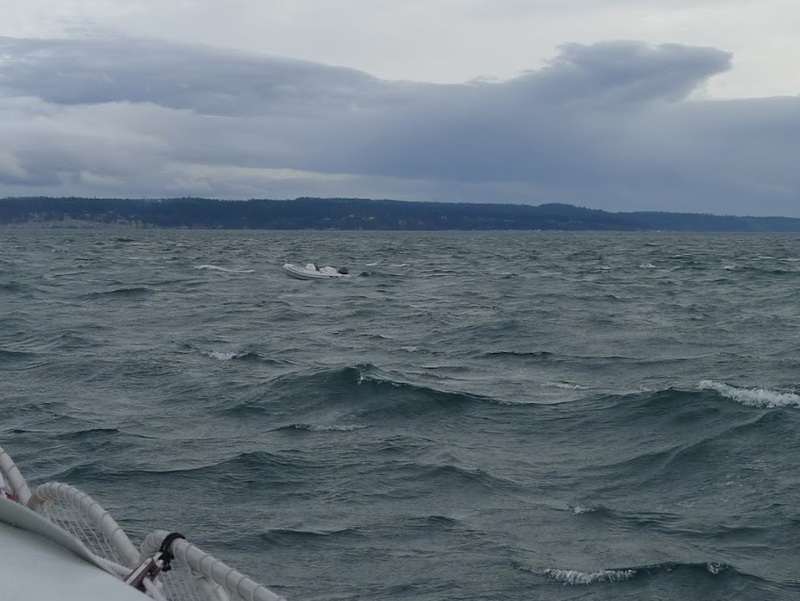 Last fall I recovered this tender that had come adrift from it's mother ship several hours prior in Admiralty Inlet (the entrance to Puget Sound). Here is tender after I hauled it out and prepared it for delivery to it's very grateful owner (2 hour drive). The mother ship was perhaps 60 feet long and was powering into waves not larger than 6 feet (the wind had died substantially by the time I took the above photo). The Vessel was equipped with a swim-step lift/davit not unlike the one pictured below. The problem with this system was that as the mother ship pitched up, the stern submerged and the dingy simply floated off it's cradle, breaking the marginal hold-down straps. If stronger hold-downs where used, then I believe there would be great danger of damaging the davit and/or the hull where it attaches. This system seems unsuitable for off-shore use. You are a good man Panope, also great information to reference. I concur with Panope. Once upon a time TNT hydraulic swim platform lift/chocks were the rage down here. Everybody had to have one, and they are pretty cool until (keyword) caught in heavy seas that tore them (just the tender if lucky)off the boat sinking several of the boats that had them.That 3788 I took in trade had one but it's next owner had it removed. They were expensive too! Do you mean the St. Croix system, linked in post #2? Ours is a roll-on system, but the dinghy mounts from the side, not from aft as in the St. Croix system pictured in the post #2 link. See here JATCO Marine Products - Online Catalog and our installation comes closest to the MD-450 model. The Jatco roll-on feature also makes it different from the Hurley design, which kinda looks to me like the St. Croix system but without the wheels. In any case, I tend to agree that there can be serious issues with sea states, off shore or not. We address that in a few different ways. First, I replaced the original wheels with a larger diameter, partly to raise the dinghy, but in our case it was more about matching the mount profile to the new (current) dinghy when we upgraded. Third is usually about direction and speed of travel. Sometimes I can improve the ride -- and take some strain off the dinghy and swim platform -- by tacking, slowing, whatever. And then there's the Stay Home option. I'm often able to wait out the weather... although of course that's not foolproof and doesn't help if we're caught out in it. Anyway, just some thoughts. Not a recommendation. So here is the update... I wasn't able to give details about the dink 'cause we didn't have one. After reading a bunch more about the whole Davit issue here, I began to realize my limitations and scaled back on the whole project. 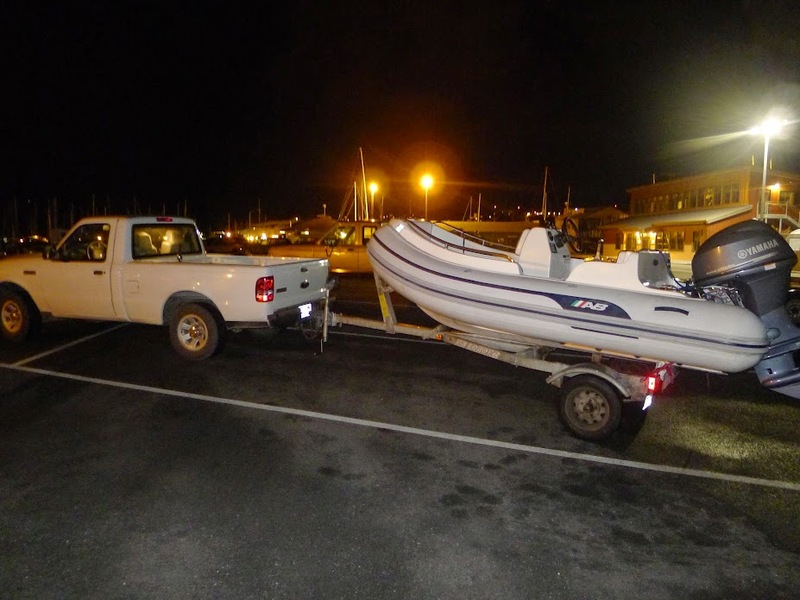 We found an 11 1/2 foot Avon RIB with a small fiberglass bow with steering and controls for the 9.9 HP Yamaha 4 stroke outboard. Has a nice double bench seat setup so will seat 4 comfortably. Wife really likes the electric start and permanent seating. This weights 110 lbs, dry and motor is 85. Got a set of St Croix tip up Davits that attaches to the swimstep that is rated for 450 lbs, so we're good there. Will be adding support rods to add support for the dink and especially the motor as we also got a swivel motor mount because the motor will be difficult to remove with the linkages there. So I'm hoping this will work well, not sure I would attempt this for off-shore, we'll be tooling around the S. F. Bay-CA delta with it now to test it out. Really appreciated all you help and suggestions. And to anyone who would rescue a rogue dink, then load it up and drive two hours to deliver to it's owner- nice job, man!! I have a theory you can't give something like that away..... Somethin' good will come back to you. ...........And to anyone who would rescue a rogue dink, then load it up and drive two hours to deliver to it's owner- nice job, man!! I have a theory you can't give something like that away..... Somethin' good will come back to you. Full disclosure: I was happy to recover the dink and bring it back to my slip out of the goodness of my heart. When I contacted the owner he revealed that it would be cumbersome for him to retrieve it as he did not own a trailer. He asked if I new someone locally that he could hire to at least get the dink out of the water. It told him that I could do it for a nominal fee. I could tell he already felt bad about my day of sailing being interrupted (I really did not mind). He then said he was planning on giving me $X,000 for the salvage. This was a ridiculous amount of money so I told him for that kind of dough I will deliver the dink to his front door. The next morning I met the man at his home, launched the dink and he handed me an envelope. Driving home I peeked inside and sure enough, it contained the amount he said he would give for the salvage PLUS another grand for the delivery to his home. I tried hard to "earn" the salvage money but he foiled that plan by giving even more. The man was a real gentleman. In a follow up email, I told him that when he is in the area I would be happy to take him sailing or to retrieve is tender anytime. had something similar happen to me this summer....though hard to accept...truly wonderful to feel appreciated that much.